As good as asana practice made me feel, performing poses for an hour a day and then stowing my mat and sleepwalking through the rest of my life was no longer an option. I had to ask myself how, as a city dweller with a full-time job, I could let my practice infiltrate my life so the whole thing became an expression of yoga. In this book Bell brings together the teachings of Patanjali and the Buddha. She describes how she took Patanjali’s eightfold path, as set forth in his Yoga Sutras, and the Buddha’s practice of mindfulness into her daily life–with practicality and precision, grace and guts. Her insights honor these timeless teachings and are relevant to contemporary life. She recounts personal stories that depict her commitment to practice in her own life: in relationships, music, asana, meditation, teaching, and even writing this book. And it’s not all rosy. She writes about self-doubt and struggles; she acknowledges times of discouragement and practicing too hard. Her antidote: welcoming, time and again, the life that she has, imperfections and all. Charlotte Bell shows by example how to be a yogi in the particularity of your own life. Her suggestions about how to bring mindfulness into asana will deepen your practice; her recommended daily practices, or Reflections, will reveal new inner landscapes. 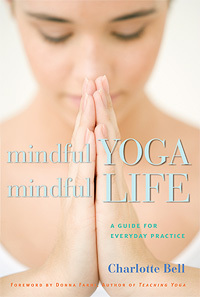 Mindful Yoga, Mindful Life is an inspiring guide for anyone seeking to live a yogic life.